From my book, How To Grow: a guide for gardeners who can’t garden yet. As my splendid friend, Ben ‘Yes Chef’ Christopherson said when I ran him through this recipe, ‘I love this, it tastes amazing, and there is the element of “why the hell am I doing this, this can’t possibly be right?”, which all the best recipes should have.’ Wise words, Ben. Wise words. Serves 2 as a side dish, or 4 as a starter with smoked salmon. Preheat your oven to 160C/300F/gas 2. Rummage around for the smallest ovenproof dish that will fit your beetroot as snuggly as possible. 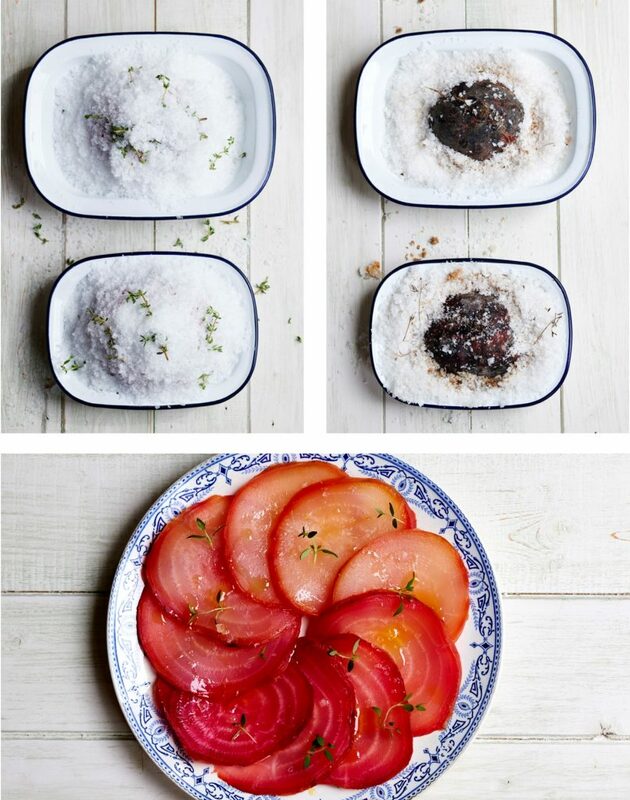 Pour a generous layer of salt into the dish, making a large dimple to rest your beetroot on, and pop him in. Add the thyme on top and around your beetroot, then keep pouring salt until your beetroot is entombed in a salt mountain. Then pop him in the oven for 45–60 minutes. The beetroot is done when a sharp knife slips in easily. A bit like pasta, the perfect texture of beetroot is down to personal taste. I like it a little firm in the middle, so take it out after 50 minutes. It also depends on the size of your beetroot, so pop him back in for a bit longer if he isn’t quite done. Once cooked, remove the dish from the oven and leave to cool for a few minutes. Then dive on in there and rescue your baked beetroot. (I let the salt cool, then keep it in a Kilner jar to use again.) Slice his skin and ends off by running a knife from top to bottom, gently peeling it away. 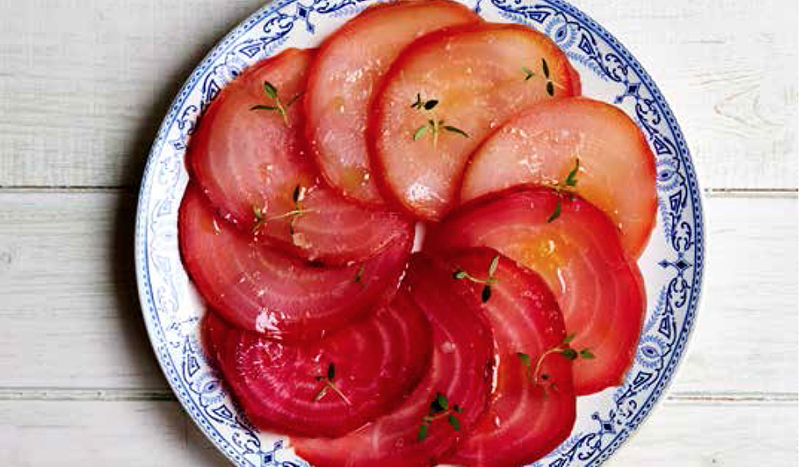 Carefully slice into thin slices, then arrange in an impressive, arty fashion on a plate. An excellent side dish, or delicious starter served with slithers of smoked salmon, watercress, good olive oil and freshly grated horseradish.